If you're not sure what Chenille is, you'll quickly recognize the soft and buttery texture of it the moment you feel it. Chenille is great for men who like sweaters that don't have that itch that some sweaters have associated to it. 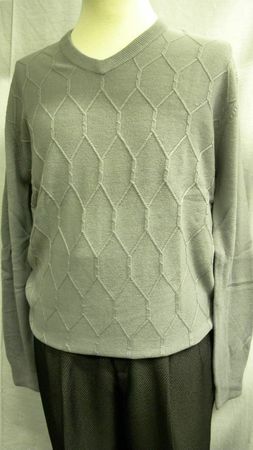 This solid grey color v-neck sweater features a nice knit octagon patttern on front and is great to wear with both jeans or even dress pants. It's up to you.